Knowing most instances of neck pain are due to some type of muscle strain won’t do much to make a “kink” any less distracting. The resulting discomfort can range from a mild annoyance to a sensation that’s persistent and painful. Luckily, there are some steps you can take to soothe aching neck muscles when you feel unexpected tension or strain. Physical therapy for neck pain can be passive in the form of the application of heat or ice or active in the form of stretching exercises. Learning how to properly stretch your neck muscles strengthens the tissues in your cervical spine and may further minimize neck pain. Physical therapists often recommend stretches or exercises that can safely be done at home or work. Magnesium naturally encourages the flow of nerve pulses in a way that may keep muscles flexible while also relieving tension and stress. This mineral is found in abundance in green, leafy veggies, pumpkin seeds, and chocolate. Foods with natural anti-inflammatory properties like blueberries and strawberries, almonds, and sardines may further ease neck pain. Involving the careful insertion of sterilized needles into specific pressure points, acupuncture has a long history of being used to promote muscle relaxation. Massage therapy for the relief of neck kinks can be in the form of hand manipulation or involve the application of topical creams to soothe aching muscles. Discs that support the seven bones of your neck need sufficient hydration to function properly. Drinking at least 8 glasses of water per day can also benefit other soft tissues in and around your neck area. Muscle relaxants, antidepressants, and narcotic pain relievers are among the medications that may ease pain from neck kinks. Some board-certified spine physicians in Los Angeles might recommend starting with over-the-counter medications before turning to prescription drugs because long-term use isn’t recommended for some meds. Corticosteroid injections directly into the affected area may be recommended for immediate relief. If none of these steps are working for you, it might be worth considering spine surgery in Los Angeles. However, barring a medical emergency, surgery for neck pain is often a last resort. The good news is that neck pain stemming from a fairly common source such as a herniated disc or a compressed nerve often goes away or becomes manageable after surgery. 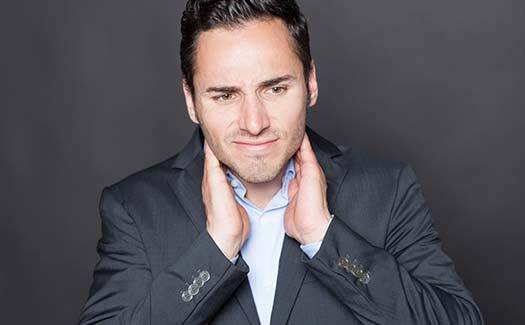 Though necks kinks tend to be less serious, there are other conditions that might require more extensive treatment, including surgery. At The Spine Institute Center for Spinal Restoration, we specialize in the minimally invasive spine surgery Los Angeles patients claim has helped alleviate their pain. Give us a call today at 310-828-7757 to schedule an in-person evaluation.